Steeping yourself in steaming pools of mineral water under a canopy of evergreens is one of those pinch-me moments that make life in the Pacific Northwest feel like a dream. And lucky for us, we’ve got pinch-me moments aplenty. The geothermal activity that gave rise to our majestic mountain peaks also spawned a bounty of hot-water baths scattered across the region. 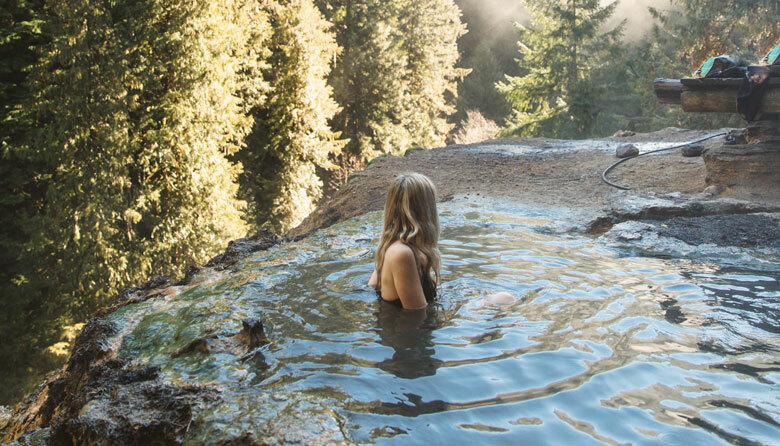 To help you find the perfect place to soothe your muscles and restore your soul, we rounded up a list of some of the best hot springs the Northwest has to offer. Pack a towel and bathing suit—or not. Clothing is optional at many of the hot springs. This easy 4.8-mile (round-trip) hike along a gravel road in Olympic National Park’s Elwha River Valley takes you to more than a dozen small rock and sand pools interspersed among evergreen trees. Temperatures range from 100 to 112 degrees, and the depth of the water varies from a few inches to at least a foot. If you want to camp nearby, make a reservation at the Boulder Creek Campground. Clothing optional. > If you go The trailhead is about 20 miles south of Port Angeles. For more information, visit wta.org. Olympic National Park entrance fee is $25/vehicle, good for seven days. Here you can steep yourself in lush wilderness, waterfalls and rock pools with temperatures ranging from 104 to 111 degrees, but you’ll have to work for it. Drive 60 miles east of Seattle to the foothills of the North Cascades, then trek another 15 miles on an unpaved U.S. Forest Service road to the trailhead. After a 5-mile hike through old-growth forest, you’ll find hot springs heaven, plus a primitive campground for overnight stays. Run by the nonprofit Northwest Wilderness Program, reservations are required, as is a Northwest Forest Pass and a high-clearance vehicle. Clothing optional. Not far from Eugene, Oregon, five rock-walled pools, with temperatures varying from 90 to 112 degrees, cascade down a lush green gully in Willamette National Forest. With its easy quarter-mile access trail, toilet facilities and gorgeous scenery, it’s one of the most popular hot springs in the state, so don’t expect solitude. Clothing optional. > If you go Eugene is about a four-and-a-half-hour drive south of Seattle; the hot springs (fs.usda.gov) are an hour east of Eugene. Free, but parking is $7. > If you go Roseburg, Oregon, is about a five-and-a-half-hour drive south of Seattle; the hots springs are an additional hour east of Roseburg. Find more information at fs.usda.gov. Free, with $5 parking fee if you don’t have a Northwest Forest Pass. End your scenic hikes through lush Olympic National Park with a stint in one of the three mineral soaking pools, ranging from 99 to 104 degrees (there’s also a 50-degree freshwater pool), at this venerable resort. You can add on a massage, sit down to a hot meal in the on-site restaurant, and even stay overnight in the lodge, cabins or campground. > if you go Sol Duc is in the northwest corner of Olympic National Park, about an hour’s drive west of Port Angeles, and a three-and-a-half -hour drive from Seattle. Fees are $11-$15. Find details at olympicnationalparks.com; reserve a room or campsite at nationalparkreservations.com. The wellness vibe is strong at this quiet retreat, where you can combine your mineral soak with massages, vegetarian meals, yoga, meditation, sauna and a stone labyrinth. Come for the day or book a personal retreat, including a stay in the lodge and meals. > if you go Breitenbush is an hour’s drive east of Salem, Oregon, and about a five-hour drive from Seattle. Day fees $22–$38 per adult; reservations are required. Visit breitenbush.com or call 503.854.3320. At this resort in the Columbia River Gorge, you can step back in time with a soak in the clawfoot tub in the 1930s-era bathhouse. Or take a dip in the indoor mineral soaking pool. It’s the perfect way to unwind after spending the day at the resort’s 18-hole Elk Ridge Golf Course, which overlooks the stunning Gorge. Some of the rooms even have hot tubs filled with the spring’s mineral water on their private decks overlooking the Wind River. > if you go The resort is about 50 miles east of Portland, and a three-and-a-half-hour drive from Seattle. Fees are $8-$15 for the general public; free for overnight guests. Find information at carsonhotspringresort.com. To keep public hot springs from being shut down, we have to treat them with respect. Pack out everything you bring in, leave the alcohol and glass bottles at home, remember that freedom to be naked doesn’t mean freedom to be lewd, and be prepared to pay day-use fees or get a Northwest Forest Pass.